Knowing that I have many readers in the smartphone industry as well as the analyst community, I'd like to explain why I believe this was the right time to buy Apple stock. As I'll explain further below, patents are not the reason. To the contrary, in a hypothetical parallel universe in which the patent system would be abolished, Apple would do even better. Trademarks and copyrights are important forms of intellectual property protection for Apple; patents, however, are a net negative. Patents will always cost Apple more, financially and strategically, than it generates. So what I wrote a couple of days ago about how even the #1 Apple fanboy among U.S. judges (not Judge Koh; she's just the worst pro-weak-patent activist out there, definitely worse than her frequently-criticized colleagues in the Eastern District of Texas) has lost his faith in some of Apple's patents-in-suit against Samsung is not really relevant to what I think of Apple's overall outlook. My disagreement with Apple on its choice of a license for Swift also wasn't a key consideration. In five years or so Apple may regret that decision (Apple is just being too generous with respect to Swift), but I doubt that the impact will be dramatic even in that scenario. I believe that Apple's stock has now, for some time, been going in just the opposite direction as its business. 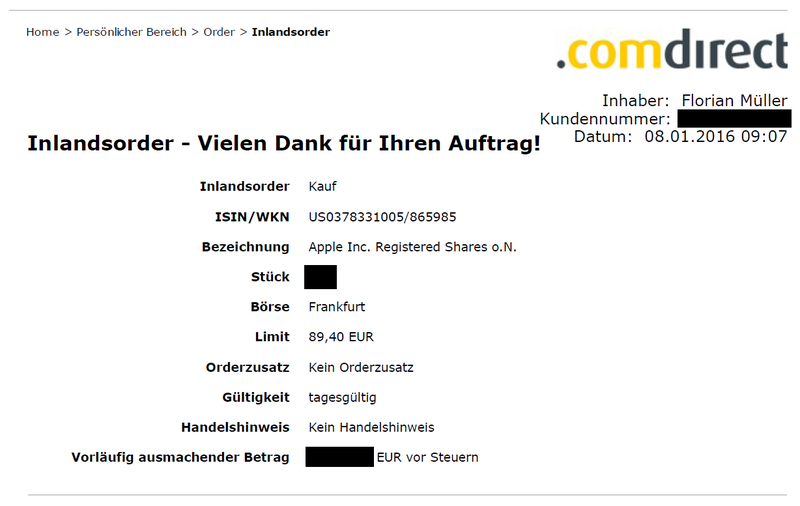 I am aware of rumors about a slow-down of iPhone production due to weaker demand, but in this case I decided to actually buy on a negative rumor--and I won't sell on the news, whatever the news will be, because I've decided not to sell a single one of those Apple shares until I see how the Apple car performs in a few years. In the meantime, nothing is going to make me nervous. Not too long ago I honestly did believe that history would, at a higher level, repeat itself, with Android doing to the iPhone what Windows did to the original Mac. I don't doubt that Android will continue to be the #1 operating system--not just the #1 mobile operating system--but Apple will continue to be the most profitable device maker. There are some other exciting companies out there. Among the major players, there are some other large and fast-growing ones: Alphabet (GOOG), Amazon (AMZN), and Facebook (FB). But all three are very expensive in terms of PE ratio while AAPL, at the current ratio and all things considered, appears a steal to me. When I say PE here, I mean PE with respect to enterprise value (market cap minus cash reserves), of course. Of the three alternatives I just mentioned, I actually think Facebook is at the greatest risk of losing its market leadership at some point. Just like Facebook sucked other social networks (like MySpace) dry, it could happen to Facebook at some point (imagine what could have happened if Google had done a better strategic job, and maybe been more willing to take antitrust risks, with Google+, or if someone like Google had acquired WhatsApp, or if Microsoft had had more of a vision for Skype). Amazon is a very interesting company, and my app development company will use AWS for the heavy-duty part of our cloud (user data, scoring/ranking data). But the PE ratio is extreme. Alphabet would definitely be my choice if I had to give X amount of $ to a company and should choose the one that is most likely to use it in a way that benefits mankind. Alphabet is really trying to improve people's lives, to save lives, possibly even to extend life, and that's because it has fantastic founders who are still practically in control. If Tim Cook wanted to spend billions of dollars on, say, medical technologies, his shareholders simply wouldn't allow him to do that. Also, if someone asked me which of those companies has the greatest potential upside, I would bet on GOOG. But... the current PE ratio just makes it very expensive. I don't mean to say it's worth less, but at its current price it's just not a steal, unlike AAPL. The problem Apple had in the 1990s was that at some point independent software vendors (ISVs) lost interest in the Mac because the volume business was all on Windows. I remember how the president of the Software Publishers Association Europe told us board members not to leave the room when Apple, one of our conference sponsors, would give its (ISV-oriented) keynote. But that's different now. In the 1990s, you could perhaps charge 10% more for a Mac program than for its Windows counterpart, but in today's "freemium" world, the difference in terms of per-user revenue potential is huge. That's why one of the two apps I'm working on (yes, taking time, but this is definitely the year of the launch) will be released on iOS first, though we're now (again) doing some Android coding as well. All in all the revenue opportunity on iOS will continue to be huge, so there won't be a lack of ISV commitment to iOS anytime soon. I'm a big believer in 3d touch. At least one Android device maker delivered it prior to Apple, and others will deliver it soon. But fragmentation is a huge problem for Android, and iOS developers are particularly fast adopters of exciting new technologies, so over the next couple of years the user experience gap between iOS and Android devices, which is limited right now, could widen. Few people would consciously buy a device because of 3d touch, but if many apps put it to use in smart ways, customer satisfaction will benefit and that will ultimately drive sales. The automotive industry has not been sufficiently innovative. Tesla is showing the way, but Apple may be able to do this in a far more profitable way. Someone said that even if Apple built a business as valuable as Daimler (Mercedes) and BMW combined, it would be worth less than the iPhone business, but that's just based on the assumption of old-fashioned business models. Apple has previously changed the business model of entire industries (music, for example), and that may happen again. Google is also working on some interesting technology in that area but Apple appears best positioned to turn self-driving, electric cars into great and lucrative products, and to leverage unbelievable synergies--more than anyone would imagine now--with its other products. Self-driving cars will also get Apple involved with the wider field of robotics. That is an area in which Apple will hopefully invest aggressively, but it still has time and untold amounts of money to do so. BYOD (Bring Your Own Device) is a major factor in enterprise IT, and (also through its partnership with IBM) Apple may actually be able to take market share away from Microsoft in that market. I'm very disappointed at the quality of Windows 10, to the extent that even I may switch to a Mac desktop in the near term. I find it interesting that most of the developers on my team actually run Windows on a Macbook (using Parallels). Apple is just so much better than Microsoft (even Nadella's Microsoft, let alone Ballmer's) at understanding what users want that I see quite some potential there. It may appear hard to imagine that Steve Jobs could be overrated, but he can be, and he actually is as far as judgment is concerned. There's no doubt that he was a genius, but there are credible claims that he was originally opposed to creating a third-party App Store, and if others hadn't convinced him to do so, Android might really have killed the iPhone shortly after its launch. There's also this story from credible sources that he refused to undergo surgery for a long time after his cancer had been diagnosed because in his New Age thinking surgery would harm, not heal, his body. He wasn't always right, he wasn't always rational, and from what I hear, he was also a very difficult person to work with. If Tim Cook and his team continue to execute well, such as on the Apple Car, then it could very well be that in a few years' time the stock market will conclude Apple's leadership team is, in terms of making the right decisions, stronger than ever. So why don't I believe in Apple having a net benefit from patents? I just believe the patent system isn't working for a lot of companies in this industry. It's certainly great for trolls and for lawyers, and for the top brass of the world's various patent offices (and I don't want to be a hypocrite so I'll admit it also used to be great for me for a few years), but in a field of granular incremental innovation like information and communications technologies, the system simply doesn't work. When most patent claims are invalidated once they face a serious challenge (here's a very interesting study that I'd like to recommend), it's more of a lottery than anything else. Companies need to assert dozens of patents in hopes of maybe prevailing on a few, and then the remedies they get over the few they prevail on are usually not impactful. Basically, when you license patents, you don't even know whether you get any serious value; the value is just in eliminating that off-chance of someone maybe getting you into serious trouble after years of litigation (where most claims would fail, but maybe one or two would have impact) and in saving the cost of protracted litigation. It's just a perversion of the concept of intellectual property. Some error rate is, of course, acceptable in every kind of legal system. But the error rate relating to information and communications technology patents is not just 1% or 5% or 10%. It's more like a search for a needle in a haystack to find a valid and valuable patent. In all of the lawsuits I've watched so far, I haven't seen even one patent that impressed me. Not one. But I've seen countless junk patents from many companies, including several of the largest and most well-respected companies in this industry, including Apple. No "patent quality" initiative will ever be able to serve the problem for this industry. There's so much prior art out there, much of which is not even found in patent databases, that the examination cost of a patent would have to reach hundreds of thousands, if not millions of dollars, and the rejection rate would have to exceed 99.9%, in order to ensure that every patent that is granted in this field of technology would be valid and valuable (and justify a 20-year monopoly). Apple is innovative in ways that the patent system doesn't reward. There's a fundamental disconnect between what is protected by patents (i.e., playing a legal game well and having a certain discipline in place) and what customers care about. When I'm unhappy as a Windows 10 user because of stability and usability issues, it doesn't help me that Microsoft has over the years filed for many thousands of patents on the thing. The program code that I want to work well is protected by copyright. Patents on software and software-controlled technologies overreward ideas, of which there is actually no shortage, and penalize those who execute well. Apple's strength is in both ideas and execution. And it's not in being first, but in being first to do it right. This whole notion that the patent system stimulates innovation because it incentivizes efforts to be first to come up with something is plain wrong: as long as there is sufficient competition, companies will innovate anyway. Apple's bottom line with patents is, and will forever reamin, negative. Apple settled with Ericsson a short while ago and is presumably going to pay billions of dollars for its extended license. Apple will continue to be a net payer vis-à-vis Nokia. It's a net payer vis-à-vis Chinese device makers, and it doesn't even dare to sue any of them, though the strategic threat to Apple's business from those companies can't be ignored. Whatever little will ultimately come out of Apple v. Samsung, it won't offset what Apple has to pay to other large companies, and may not even the cost of patent filings and of having to defend against countless trolls (including privateers and trollified, failed businesses) all the time. Trademark and copyright are intellectual property rights that, unlike information and communications technology patents, really deserve to be called intellectual property. Those rights, combined with trade secrets, protect innovators well, and they serve Apple well. Before there were software patents, companies like Microsoft, Oracle and SAP--and Apple--came out of nothing and became huge. So there's empirical evidence that "patent protection" is not needed to succeed in this industry.